Coll. No. 1442, 22 June 2016, characters observed: Perennial herb, to 35 cm. ; Leaves, cauline, opposite, spreading horizontal, petiole 2 mm. + blade 50 mm. × 24 mm. wide, ovate, margin revolute; Sepals, 2.5 mm. ; Flowers, bell-shaped, 6 mm. × 5 mm. wide, >2× calyx; Petals, fused at base, tube mm. + lobes 2 mm., pink, drying purple, lobes erect to spreading, none reflexed; Stamens, 5. Filaments, distinct; More like A. androsaemifolium than A. cannabinum, but it seems to best fit the description of the hybrid A. ×floribundum. North Table Mountain Trail, City of Golden, Jefferson County, Colorado: near pk bdy. Field Notes: Coll. No. 1442, 22 Jun 2016. 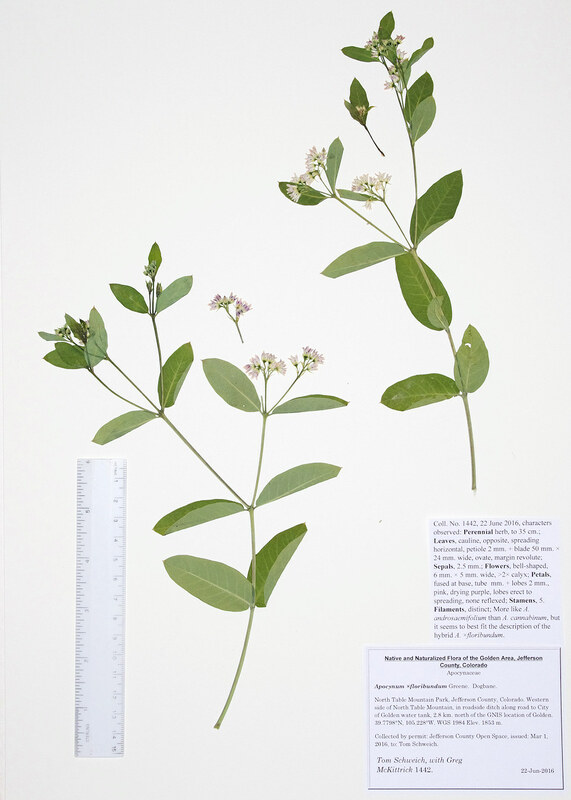 Other photos about Species or Apocynaceae Apocynum ×floribundum.